After a few days of consolidating, U.S. equities continue to trade well. That’s got many investors feeling better than they have throughout most of 2018. With that in mind, here are our top stock trades for Thursday. Of course we have to talk about Tesla Inc (NASDAQ:TSLA) first. The after-hours response to Tesla’s annual shareholder meeting was slightly positive, although mostly muted. Investors wouldn’t have guessed that based on its 9% rally on Wednesday though. Share are flying after CEO Elon Musk reassured investors about Model 3 production and not needing to raise capital. The stock has vaulted through my key range of $300 to $310 and has climbed through its 50-day and 100-day moving average. With a massive 31% short interest, a short-squeeze is more realistic than some may realize. Should Tesla stock climb above its 200-day moving average, it could trigger a whole new wave of buy-to-cover stop-loss orders. A tall order for sure, but above $330 and Tesla stock should really fly as shorts scramble to cover their position. The rants on Twitter Inc (NASDAQ:TWTR) will be epic if this happens. 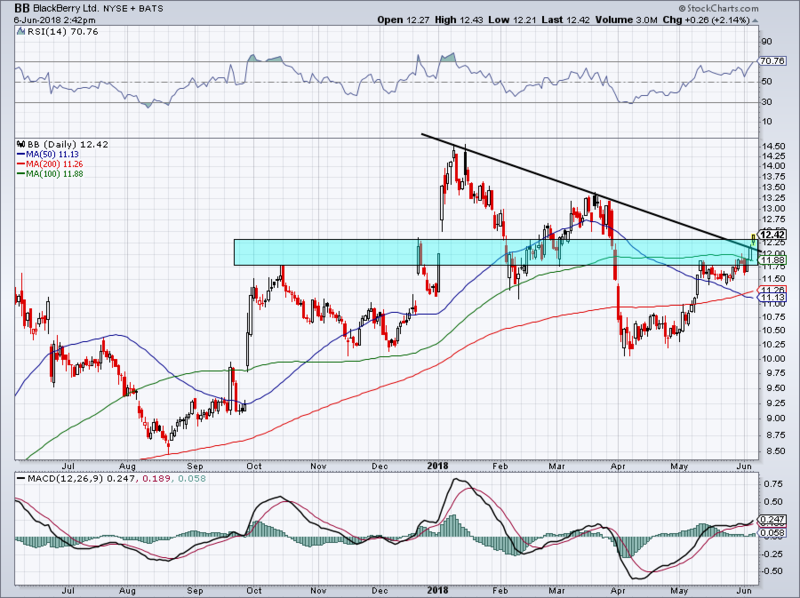 We recently took a look at Advanced Micro Devices, Inc. (NASDAQ:AMD) as it approached long-term resistance near $13.50. Because we were buyers below $10, we felt this was an opportune time to book some profits. Of course, here we are at almost $16. But shares of AMD are really getting elevated. Just two months ago AMD bulls were praying it wouldn’t break below $9. Now it’s up 75% from those levels. It’s getting tired and as much as I love the fundamental story, there’s no way we’re chasing AMD up here. 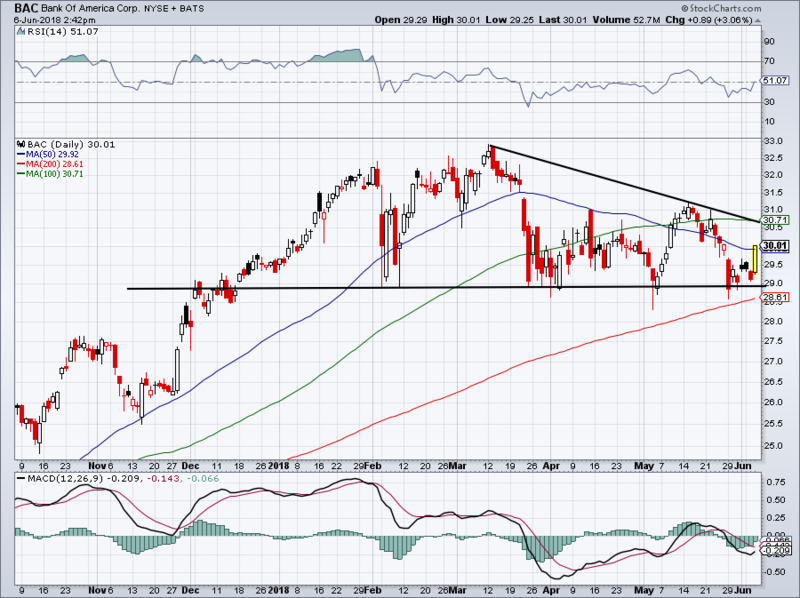 In fact, shorts who are prudent enough to use proper risk-management can even take a stab at AMD on the short side. With long-term resistance near $15 to $15.50 and an RSI of more than 86 (blue circle), it’s not the worse trade setup in the world. While there are certainly some losers we could pick on Wednesday, Boeing Co (NYSE:BA) isn’t one of them. A few weeks ago it tested the $365 level and retreated, allowing it to consolidate and recharge before another attempt. This time, BA stock showed no hesitation powering through the level. 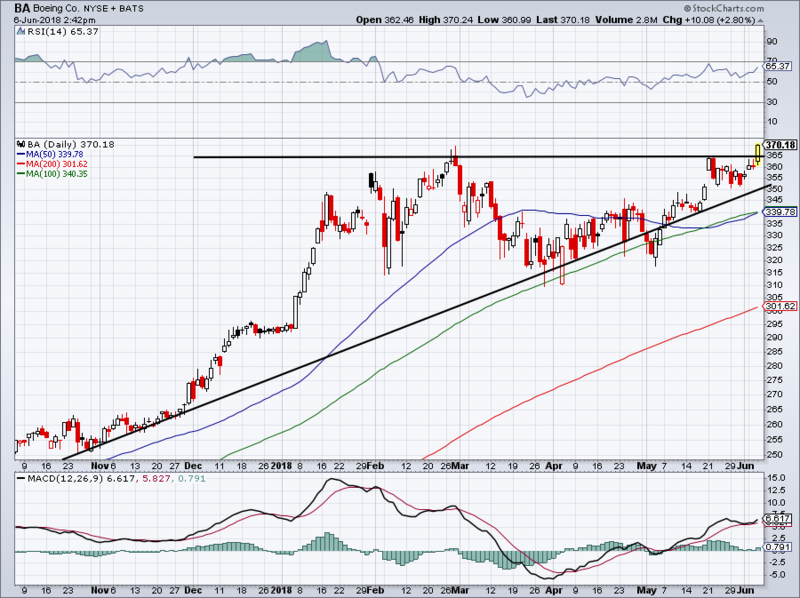 It’s possible that BA will fail to push through its 52-week highs from February, which are about $1 per share away. Boeing isn’t overbought though and investors may be tempted to rotate out of the super-hot tech sector and names like AMD, into stocks with solid fundamentals that still have attractive chart setups. BA could be the perfect fit. Conservative bulls buying now may want to consider using a $365 stop-loss. Those looking for a deeper pullback first should consider buying between $340 and $350. Will a 3% yield on the 10-year cause another market stumble? Perhaps, but investors aren’t showing any worry about it. On Wednesday, bank stocks weren’t showing any worry either. Bank of America Corp (NYSE:BAC), JPMorgan Chase & Co (NYSE:JPM) and Goldman Sachs Group Inc (NYSE:GS) were all rallying on the day. Although technically through its 50-day, I still have some concern for BAC despite loving its fundamentals, valuation and the economic backdrop. Should the 50-day swat BAC back down, look for support near $29, which has held all year long. Should BAC continue higher, look to see how it handles $30.70, where its 100-day moving average and downtrend resistance currently rest. 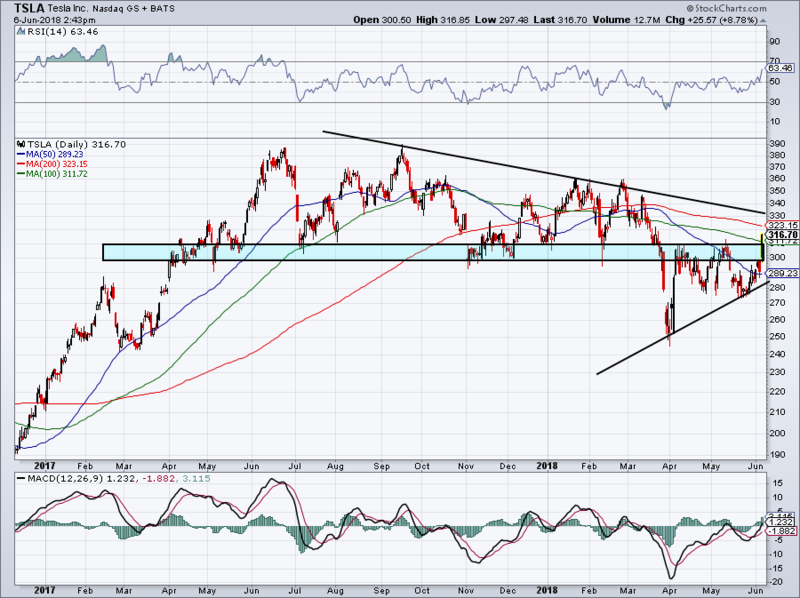 Like the transports (and BA) though, BAC and the banks may benefit from some sector rotation. 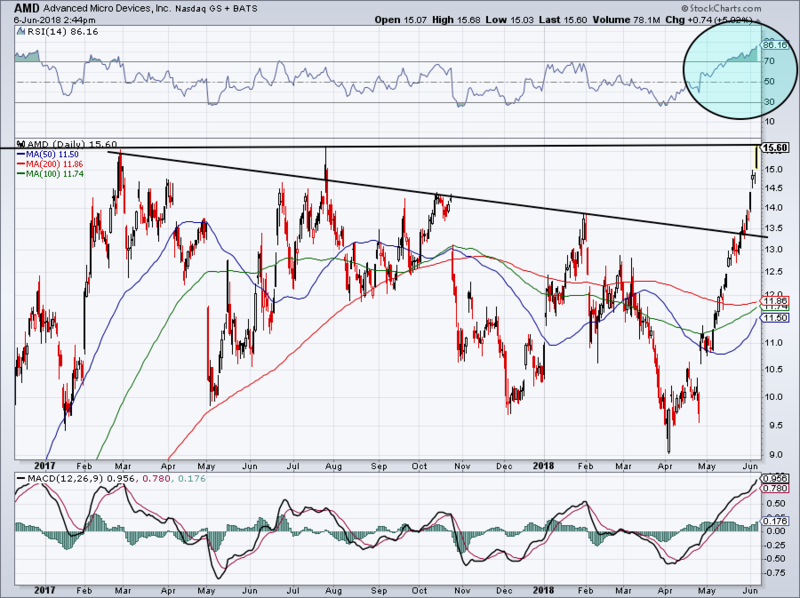 It’s been a while since we’ve talked about BlackBerry Ltd (NYSE:BB), but shares are showing some resilience right now. On Wednesday, BB jumped 2.2% and hurdled a significant level of support. It also cleared that menacing area between $11.75 and $12.25. Should it hold up now, it could be off to the races for BB. $12.50 could prove to be a tough hurdle though and if BB doesn’t consolidate near current levels, look for support on the backside of the previous downtrend resistance line. Bret Kenwell is the manager and author of Future Blue Chips and is on Twitter @BretKenwell. As of this writing, Bret Kenwell held a long position in BAC and a short position in AMD. Article printed from InvestorPlace Media, https://investorplace.com/2018/06/5-top-stock-trades-for-thursday-morning-amd-ba-bac-bb-tsla/.